Accra, Nov. 5, Palaver -- INFORMATION reaching your authoritative 'Ghana Palaver' from our usually highly reliable sources have confirmed that if Ghanaians re-elect the Kufuor Administration in the upcoming elections, its avowed aim of making the Asantehene, Otumfuo Osei Tutu II the King of Ghana will materialize on the forty-fifth anniversary of Ghana's Republic, July 1, 2005. The reports indicated clearly that the motion for this dramatic change in the governmental status of the country will be placed before Parliament after the budget in March, next year. It also indicated that though this would entail drastic changes to the 1992 Constitution, the Kufuor-led NPP government intends to side-step all such procedures by ordering the arrest and trial of the former President, Ex-Flt. Lt. Jerry John Rawlings and his security capo, Ex-Captain Kojo Tsikata for the murder of the three High Court Judges and the retired Army Officer in June 1982. Soon after the trial starts, President Kufuor will appear in Parliament and declare the Constitution suspended, having been promulgated by the PNDC, a government that the NRC Report had described as an illegitimate regime whose acts and deeds must be declared illegal, null and void. By mid-May 2005 the so-called NPP dominated Parliament would have completed the formulation and passage into law of a new constitution by which the Asantehene will be made the King of Ghana and Kufuor revert to the position of Prime Minister of Ghana. The Asantehene will sign bills of Parliament into law, receive foreign dignitaries, appoint state officials, etc. A series of significant events prior to this dramatic development since 2001 have convinced many observers of the political scene that such a plan to subvert the current constitutional order is very probable. First, a cultural extravaganza for traditional rulers was cornered by the Kufuor government for the Asantehene. 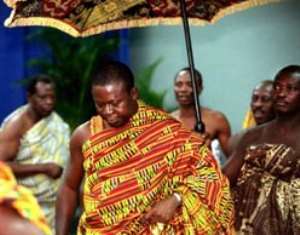 The two Ghana Expos held in Britain and the United States intended to showcase Ghana's cultural, touristic, and trade potential were hijacked by the Asantehene on the prompting of the NPP government. And to add legitimacy to the Asantehene's frequent forays into national politics, for the Ghana Expo in America recently, he had the Vice President, Alhaji Aliu Mahama in tow. Also there is a standing order from Kufuor's Castle to all companies and institutions to make regular and handsome cash donations to Manhyia Palace BEFORE they are considered for any government contract or business. But perhaps the most obvious indication of this plan was the sourcing of donor funds from the World Bank intended for the National House of Chiefs for the Otumfuo. The moment the Asantehene procured these funds, an attempt was made to throw dust into the eyes of Ghanaians by his announcement that the development projects for whcih the funds were obtained were to be sited in other regions apart from the Ashanti Region. Political observers were not fooled. The source who revealed this to the Palaver also said that the systematic elevation by the Kufuor government of the Asantehene is intended to prepare the minds of all Ghanaians for the inevitable on July 1, 2005. The source even hinted that he had cited already printed invitation cards for the installation to be held at the Independence Square and that among the host of foreign dignitaries to be hosted, wined and dined at state expense will be monarchs from as far as South Africa, Fiji, United Arab Emirates and the Seychelles. When queried as to the status of the National House of Chiefs after the Asantehene's installation as King of Ghana, the source said it will be converted into an enlarged body of the Asanteman Council, owing allegiance to the person and office of the occupant of the Golden Stool. Palaver investigations are continuing and we will keep our readers posted of developments.